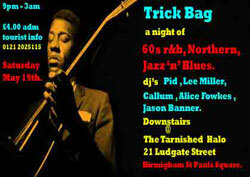 Full details are now online of a new mod night in Birmingham – Trick Bag. The night promises 60s R&B, northern, jazz and blues in a cool basement venue that can comfortably hold around 150. DJ line-up includes Pid, Lee Miller, Callum, Alice Fowkes and Jason Banner. For full details of the night and a large-sized flyer, check out the full listing in the events section.